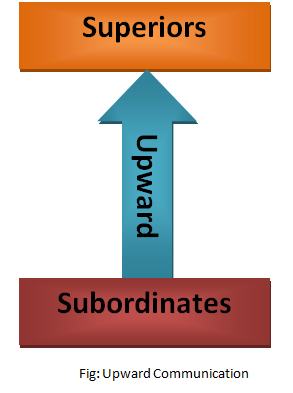 From the above discussion, it can be concluded that the communication where information flows form subordinates to superiors is known as upward communication. Upward communication conveys information related to periodic updates, requests for data, clarification of directives and requests for additional financial support. Report: Report is one of the most important a widely used media of upward communication. Subordinates prepare reposts periodically or regularly on various routine issues. They also prepare special report when need arises. Reports are then submitted to the higher authority for supplying necessary information. Memo: Memo is the short form of memorandum. A memo is a short piece of writings generally used to exchange information among the persons within the organization. Superiors usually send information to their subordinates through memo. However, subordinates can also write memos to convey essential information to their superiors for making decisions. Suggestion and complaint boxes: Some organizations install suggestion and complaint boxes at some convenient places in the office or factory through suggestion box, management invites the employees to submit their suggestions for improving the efficiency of organizational operations. On the other hand, complaint box is placed to submit any complaint of the employees regarding any aspect of their employment. Direct letters: Subordinates can write letters directly to their superiors at their superiors at their own initiation or they may be asked by their superiors write about any directed matter. Questionnaire: Sometimes managers encourage upward communication by asking questions to their subordinates. For this purpose, they distribute questionnaires to the employees. Through questionnaires, management can know the attitudes, feelings and complaints of the employees. Grievance procedure: Grievance is the employee dissatisfaction over any aspect of their employment. Grievance procedure provides the employees with a formal channel of appeal to their superiors. In modern organizations, there is well-established procedure for handing employee grievances that acts as a mode of upward communication. Joint setting of objectives: In participative organizations, superiors and subordinates sit together for setting objectives. In this case, the superiors seek information and suggestions from the bottom-level managers and employees. Employer-employee meeting: Meeting between employer and employees is a very useful medium of upward communication. In the meeting, the superior can raise problems and seek information, guidelines or suggestions from the subordinates. Other Media: In addition to written and oral media, superiors can encourage upward communication through the following symbolic medium. Open-door-policy: Open-door-policy of management inspires the employees to feel that the manger’s doors are always open to them. Whenever they want they can enter into the manager’s room and talk everything to the superiors without any fear or hesitation. These are the commonly used media of upward communication. However, all the media are not suitable for every message. Selection of a particular medium in a particular situation depends on the nature and importance of the message.